This powerful 12 v submersible pump turns any water source into endless running water. 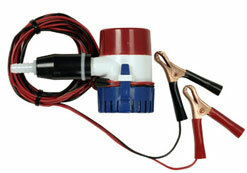 Connects to any car, boat or RV 12 volt battery for instant water pressure. Works with all Hot Tap or Stove Top models. Ideal for outfitters or large groups, Complete with 10 foot power cable. Upgrade to the 12 volt pump for extra options & convenience. *Not meant for use with Decker's Water Station, Horse Washer or Eccotemp heaters.